There are always so many new annuals and veggies on the market that it’s hard to pick just a few favorites. But here goes, some notables in 2017 for you to consider. Archangel Cherry Red Angelonia – The biggest blooms of any angelonia, it thrives in extreme heat, humidity and drought. Prince Tut Dwarf Egyptian Papyrus – half the height of King Tut, but with the same large poms on the ends of the stems, this shorty version is great for containers. 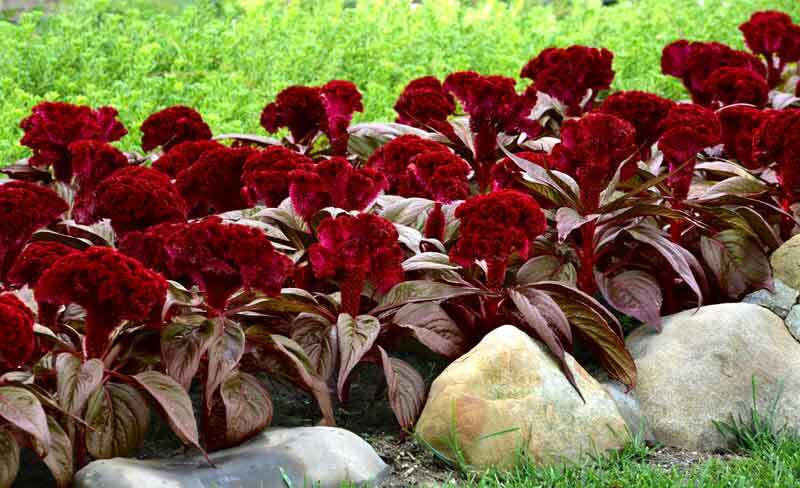 Celosia Dracula – an exotic stunner that will have you do a double take with the massive deep blood-red velvety blooms. Pentas Falling Star series – a brand new type of penta with a trailing habit, great looking in hanging baskets. Fireball French Marigold – a dwarf version of this garden workhorse with three different colors shades on one plant. Hollywood Hibiscus – the large fancy blooms make it worth adding to your landscape as a colorful annual or grow this patio-sized variety in a container. Petunia Rise N Shine Fuseables – a blend of Easy Wave yellow and rosy dawn petunias in a single container takes the guesswork out of color combos. Bee Alive Bidens – ideal for small pots and hanging baskets with eye-catching colors and flowers favored by pollinators. Zinnia Profusion Red – an AAS winner, Profusion’s compact form, disease resistance and early continuous blooms makes growing easy, and now it’s in red. Cool Wave Morpho Pansy – twice the spread and double the color, it’s the fastest-growing and longest-lasting trailing pansy for cool weather. Take 2 Tomato Combos – geared towards foodies and small space gardening with two tomato plants grown together in the same pot. Perpetua Blueberries – a double-cropping variety that sets fruit in mid-summer and then again in fall. Watch for its cousin Baby Cakes blackberry in 2018, a dwarf and thornless variety perfect for container gardening. Fresh Start Beet – grown for its leaves not the beet, this baby leaf variety has dark green leaves with well-defined dark red petioles. Kale Prism – an AAS Vegetable Award Winner, Prizm takes less space in the garden, content to be grown in containers as well as in-ground beds. Basil Pesto Party – This basil’s late-flowering habit lets you harvest for many weeks, grown from seeds. Strawberry Delizz – the first ever AAS strawberry winner, this vigorous plant is easy to grow with an abundant harvest throughout the growing season, in a compact size perfect for containers.